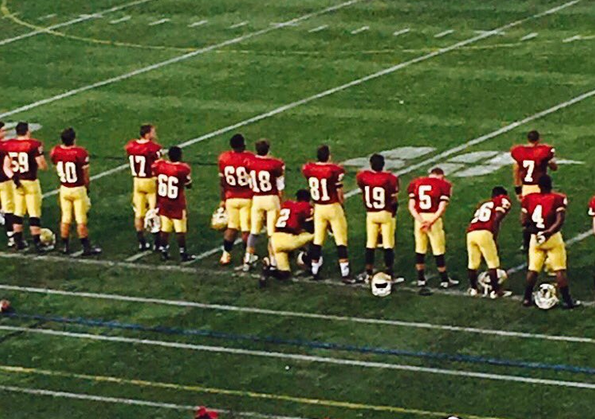 Doherty junior Mike Oppong is facing a one-game suspension after kneeling during the national anthem on Friday night. UPDATE: The suspension has been overturned. Ed. Note- Doherty's Mike Oppong has announced on Twitter that he is no longer suspended. We have left the full, original text of our blog post below. I don't think I can remember a more eventful opening week, on and off the field, for Central Mass high school football. Not only did we get thrilling shootouts, upsets and statement wins, the region also saw controversy emerge at a pair of schools over issues bigger than football. Let's take a look back at the weekend that was. We knew that Leominster, St. John's and Shepherd Hill would contend in D2 Central, but how deep would the division be? Turns out, pretty darn deep. With Algonquin gutting out a win over reigning Division 2 state champion Nashoba, Shrewsbury edging Shepherd Hill and Wachusett blowing out a good Tantasqua team, there isn't an easy win to be found in Central MA's largest division. Leominster and St. John's also picked up wins, with the Blue Devils holding off scrappy Doherty and the Pioneers edging Catholic Memorial, but those other three teams really answered some questions. Shrewsbury was coming off a non-playoff season and dealing with a quarterback decision. In the end, the Colonials went with sophomore Drew Dampanale over junior Chris Campbell, but let's just say there are no hard feeling between the two, because Campanale threw the game-winning touchdown to Campbell with less than four minutes to play. Campanale was a model of efficiency on the night, completing 10 of 11 passes with a pair of scores. It was a huge win for the Colonials in Dudley, but Algonquin wouldn't be out-done on their home turf in Northboro. After a Max Cerasoli touchdown run and a pair of Alex Polymeros field goals gave the Tomahawks a 13-0 lead, the defense smothered Nashoba's powerful offense. The Chieftains did get on the board with a kick return touchdown from senior Nate Mansour, but what a defensive performance from the T-Hawks. Any time you can run the ball and stop the run against Nashoba, you've done something pretty special. Finally, Wachusett lived up to its preseason hype, throttling Tantasqua 42-0. The Mountaineers had five different players score rushing touchdowns, and quarterback Mike Fiorelli threw a touchdown as well. Add in a dominant defense, and there's reason to believe Wachusett can play with anybody in this division. But, of course, there was some controversy at the Shepherd Hill-Shrewsbury game, as All-State running back Kevin Mensah was forced to sit out the game by the MIAA. Mensah, a senior who transferred to Shepherd Hill after playing at Holy Name the past three years, still has not been cleared to play, and Shepherd Hill coach Chris Lindstrom chose to miss the game as well, in solidarity with his player. Offensive coordinator and Associate Head Coach Ryan Dugan coached in Lindstrom's place. Three things I'd take away from here. 1. It's pretty obvious why coach Lindstrom's guys would run through a wall for him. He clearly thinks the MIAA isn't doing right by Mensah, and he's got his player's back. That is a good thing. 2. This is a bummer of a situation. Mensah is a great, humble kid, and a joy to watch play. I don't claim to know all the details of the transfer, or the hold up with the MIAA, but I hope this all gets sorted out, because the kid is a senior with the chance to earn a Division I scholarship. 3. This wasn't the reason Shrewsbury won. Yeah, having an All-State running back would help any team, but the Rams got a great game from running back Zack Magdis, and Dugan is one of the region's best assistant coaches. Shrewsbury won because it got a supremely efficient game from its young quarterback, and big plays from its defense in key situations. These two teams may see each other again, and I hope to see both Mensah and coach Lindstrom involved if that happens. 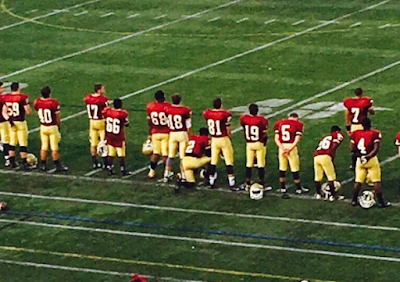 Of course, the other big off-the-field story this weekend was Doherty's Mike Oppong taking a knee during the national anthem, prior to his team's game against Leominster. Oppong joined a growing number of high school, college and pro athletes protesting racial inequality in America, sparked by San Francisco 49ers quarterback Colin Kaepernick, who began sitting for the anthem during the NFL's preseason. Sunday, Oppong announced on Twitter that he had been suspended for one game by his principal and coaches. To make matters worse, screen shots of a group chat emerged online, showing several players from at least one other school making racially-charged statements about Oppong's actions and the fallout. Look, I don't care what you think about Oppong's decision to kneel during the anthem, I think we can all agree that he has a constitutional right to do so, and that he should be judged by the content of his character, not the color of his skin. Oppong's actions and subsequent suspension have caught the attention of well-known national activists, along with members of the Black Lives Matter movement, and brought a national debate directly to the Heart of the Commonwealth. As for the suspension… I'm not the coach, I'm not the principal, we haven't heard from anybody at the school, and I don't know the whole story, so I can't comment intelligently on the situation. What I will say is, I have a ton of respect for Doherty coach Sean Mulcahy, a guy who has done amazing work with kids in Worcester for a long time. At the same time, I disagree with suspending a kid for expressing himself in a quiet, non-violent, non-disruptive manner. That would seem like the exact way we would want people to protest and start a conversation, but again, I don't know if anything else occurred, and we're still awaiting official word on the suspension. As for the group message involving players from other team(s)- I like to give people, especially high school kids, the benefit of the doubt. There were some pretty ugly things said in that message about African Americans, and I imagine some form of punishment will probably come down for those involved. At the same time, I'd like to believe these players didn't actually believe what they were saying. Hopefully it was just youthful machismo and chest puffing about an issue they cared about (patriotism), and they got carried away. It's unfortunate that, probably, the ugliest thing they've ever said is now screen grabbed on the internet for anyone to see, but hopefully those involved learned two valuable lessons. 2. Nothing you put in writing is truly private. The first of those two lessons, obviously, is the more important one. If, however, that group text does reflect the true feelings of those players, they should understand that they are part the reason Oppong, and so many others, are kneeling. If you're looking for an early candidate for our "Show Time" award, look no farther than Grafton star Ifeatu Melifonwu. The Syracuse commit carried only nine times, but rushed for 165 yards and three scores in that limited work. He also helped the Indians put together a dominant defensive effort from his defensive back spot, and was just generally all over the field. Next week brings a HUGE game as the Indians host West Boylston, and do-it-all UMass commit Cole McCubrey. Melifonwu and McCubrey might do more for their teams than any other players in CMass, and it will be awesome to see them working both sides of the ball in an anticipated match up. Reigning Division 5 state champion Northbridge just graduated, maybe, its greatest senior class in school history. After three straight state title game appearances, mostly powered by that class, many questioned whether Northbridge would again be able to contend in 2016. Brian Iarussi was successful in his first game under center, replacing the now-legendary Koby Schofer, as the threw and ran for a touchdown in Northbridge's 21-18 win over St. Peter-Marian. The Rams had a special teams lapse late, giving up a 75-yard punt return for a touchdown to SPM's Matt Dumphy, but all things considered, a great first showing for a young team. Littleton has already established itself as one of the best small-school programs in the state, capturing a Division 6 state championship in 2013, and making it back to Gillette for the state finals in 2014. But, the Tigers were upset in the first round of last year's playoffs by West Boylston, and may have some revenge on their minds, as both teams are again in the same division (now D4 Central) after re-alignment. One game in, and Littleton looks very much like the dominant team that won a state title in 2013. Griffin Shoemaker ran wild, and the Tiger defense suffocated Tyngsboro, as Littleton built a 46-0 lead, en route to a 46-8 victory. Littleton closes out its regular season with West Boylston on October 28th, and its possible they'll see the Lions a week or two after that. Until then, this team could put up some silly numbers on both sides of the ball, so keep an eye on the Tigers. Is tyngsboro quarterback playing, Kyle Laforge?